A team of researchers from UTAR Faculty of Engineering and Green Technology (FEGT) won the Best Paper Award in the Institute of Electrical and Electronic Engineers (IEEE) 2018 2nd International Conference on BioSignal Analysis, Processing and Systems (ICBAPS 2018) held at Hilton Kuching Hotel, Sarawak from 24 to 26 July 2018. 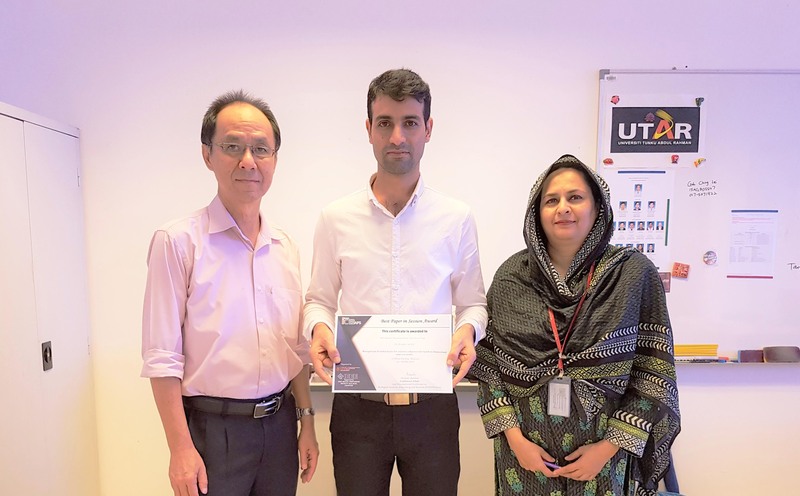 The team was comprised of Doctor of Philosophy (Engineering) student Rab Nawaz, FEGT Dean Assoc Prof Dr Yap Vooi Voon and FEGT Head of Master of Engineering (Electronic Systems) Programme Assoc Prof Dr Humaira Nisar. Their paper titled “Recognition of Useful Music for Emotion Enhancement Based on Dimensional Emotion Model” won the Best Paper Award in the Session Award category. Organised by IEEE Signal Processing Society Malaysia Chapter, the conference aimed to provide a platform for researchers and industrial practitioners to discuss and share their knowledge in various sub topics of bio-signal processing, analysis and systems. ICBAPS 2018 welcomed original submissions that have not been published. All papers were peer reviewed before acceptance. The conference was ideal for researchers to share with peers and other experts from academia and industry working in the similar research field.